Richard Irwin (Belper, United Kingdom) on 26 March 2009 in Plant & Nature. extraordinaire PDC ! magnifique ! I haven't noticed any shoots yet but there again that's probably because I haven't looked all that close. Nice clarity and light in your photo. The out of focus background really makes the foreground stand out. What a great symbolic picture of spring. 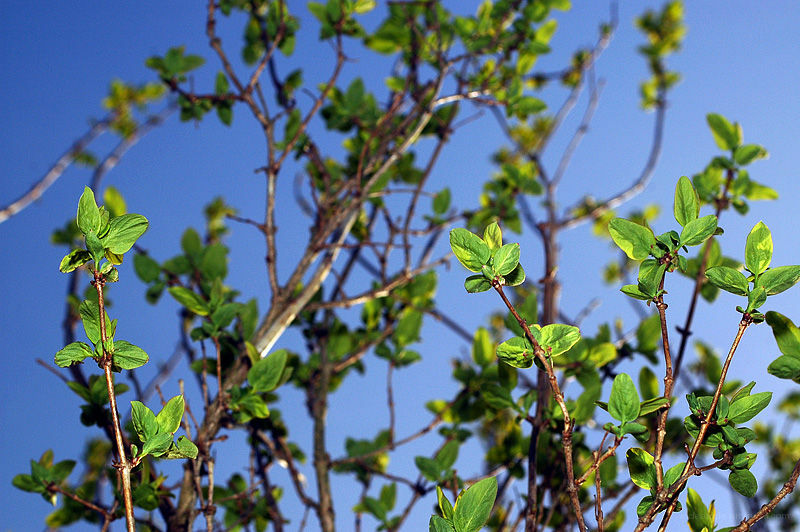 The vivid green of new leaves contrasts magnificently on the blue of the sky. These are so fresh and beautiful. The flash, if you used flash, really makes the leaves pop. I like it. i'm enjoying these very much. It is lovely seeing life appear and grow before ones very eyes. Looks like you used a flash on this one to good effect. @Earnest: I used my Nikon SB800 with diffuser head, just to pull the foreground away from the stuff behind. Really nice light. Well done. The fill-in flash has done well in this shot, the leaves really look fresh ! Wow, nice job bringing out the detail in those little leaves. What a welcome sight! Very nice light and DoF.